Heat waves and other extreme weather events, together with changes in the distribution of vector-borne diseases and allergic disorders, are some of the climate change-related challenges affecting countries in the WHO European Region, according to a new WHO report to be presented at the mid-term review of the European Environment and Health Process in Haifa on 28–30 April 2015. The status report assesses progress in implementing the European regional framework for action to protect health from climate change. As part of this, 32 Member States examined their vulnerability to health threats related to climate change. Vulnerability to intense heat stood out as a common factor across all countries. "Situations vary from country to country, of course, but climate change affects everybody across the entire Region, from young to old," explains Dr Bettina Menne, Programme Manager of the WHO Centre for Environment and Health. "While many countries have worked hard to adapt to climate change, all too often these initiatives are not embedded into national health policies and are funded from already over-stretched existing budgets," she continues. "Climate change is a cross-cutting issue in health, and what has been done so far is simply not enough to tackle the profound consequences. The health sector needs to work more and better with other sectors to scale up those measures that improve health and systematically integrate climate considerations into their own operations." Health in Europe is already suffering as a result of the effects of climate change. 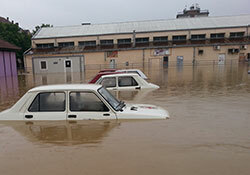 The devastating floods of May 2014 in Bosnia and Herzegovina, Croatia and Serbia affected more than 2.5 million and killed 60 people. In addition, a WHO study released in 2014 projects an annual increase of heat-related deaths in Europe, reaching 27 000 by 2050, for the over-65 age group unless action is taken now. The Parma Commitment to Act, which was endorsed in 2010 across the European Region, agreed overall goals and strategies for action that included both adapting to and tackling climate change. The Commitment also included measures to reduce exposure to and emissions of greenhouse gases and actions to improve health system resilience and environmental sustainability. The majority of countries in the WHO European Region have taken action to reduce greenhouse gas emissions as part of their national legislation and obligations under the United Nations Framework Convention on Climate Change (UNFCCC), but very few capitalize on the health co-benefits of energy, transport, building or agriculture measures that are a key immediate gain of climate change policies.